This article will be used by teachers who wish to access a list of all work submitted online by students for reviewing purposes. On the portal, click the arrow in the New Submissions section to view all newly-submitted work. 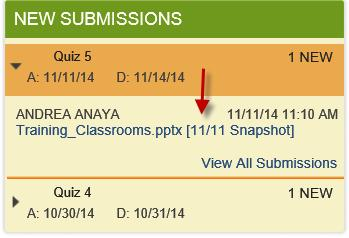 Click the assignment title in any calendar and then click the View All Submissions link. From the Curriculum tab in the Classroom, click the title of any assignment, then click View All Submissions. (pictured below). Note: In all views of student-submitted work, you will find the student's name, a time stamp, and a link to download the file. Note: If a student has submitted a .pdf file, the file will automatically load in the browser on the same tab. If you want to download the file or open it in a separate tab or window, right-click (Ctrl-click for Macs) on the link and select the action you want from the context menu.